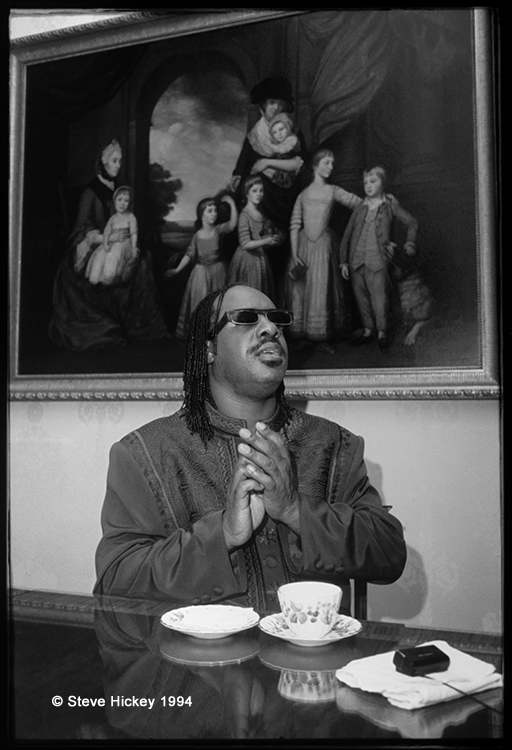 Stevie Wonder at The Lanesborough Hotel, London, December 1994. I noticed earlier this week that CBS aired a tribute to Stevie Wonder and it reminded me of the time I photographed him, so I thought that I would offer my own small tribute. This year I will have been working in photography for 40 years. I decided that I might do the occasional look back over the years in my blog so I thought that I would start with one of the best moments. It was December 1994 and I was sitting in the bar of the Lanesborough Hotel in London with a journalist, waiting to see Stevie Wonder. I had been around music photography since 1978 so had my fair share of photographing the famous. One of the first albums I bought was by Stevie Wonder, and his show at the Birmingham Odeon in 1968 was one of the first gigs I went to – so this was a bit more than just another job for me! It was a long wait in the bar, a couple of hours – so no alcohol! Eventually we were ushered in to the room and met Stevie – and what a great guy he was. One of the few stars that I have met that seemed genuinely interested in our conversation when we chatted before the interview – me mentioning the ’68 gig and him mimicking my English accent and making the atmosphere light and friendly. There were just the three of us in the room and I shot some photographs while the interview took place. We were there for maybe twenty minutes and then the interview was over. They say never meet your heroes, but sometimes it’s worth taking the chance.